"Published at the beginning of each season, Sprout is a celebration of local food, producers and cuisine. It is about living sustainably through promoting fresh, seasonal produce and encouraging people to make a difference by growing their own food and making sustainable food choices. 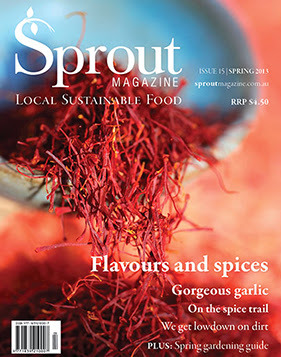 Please check out my latest feature article in Sprout Magazine's Spring edition - Flavours & Spices below. A resurgence in the local garlic industry has seen a rise in boutique garlic growing and the popularity of this piquant bulb. Australians eat 3,500 tonnes of garlic every year—and their love of this pungent bulb is growing, but most of this garlic comes from China as well as Africa, Taiwan, New Zealand and the USA. A modest local industry produces around 500 tonnes—the introduction of cheap, bleached imported garlic in the mid 1990s saw a massive decline in local production says the Australian Garlic Industry Association (AGIA). Today China is the world’s leading producer and exporter of garlic—in 2012 they produced 59 million metric tonnes. Much of this is bound for Australia with 95 per cent of garlic sold in Australia from China. The AGIA, however, says the Chinese product lacks freshness and quality assurance. ‘There is no way of regulating the pesticides or processes used in the production of garlic in China, says Henry Bell, secretary of the AGIA. ‘I don’t believe the Australian quarantine regulations are strict enough in terms of bacteria testing on imported produce’. The pristine white imported garlic is often bleached for aesthetic purposes. The AGIA also says that Chinese garlic is gamma irradiated and sprayed with Maleic Hydrazide (MH) to extend its shelf life and retard sprouting. While many scientific studies report that MH has a low acute toxicity, the United States Environmental Protection Agency says that hydrazide is a contaminant linked to tumour induction. In addition, garlic from China and is fumigated to meet Australian quarantine import regulations and protect Australia against the many pests and diseases found in China. Methyl bromide, a colourless gas is used—a highly toxic sterility agent often used as an insecticide, herbicide and fungicide. The AGIA also believes imported garlic also raises concerns over the freshness, health benefits and flavour as there is a chance it has been in storage for long periods before it is presented in supermarkets and shops. You may in fact be buying last year’s crop. The upside for consumers is that here has been a resurgence of interest in Australian garlic in the last few years. 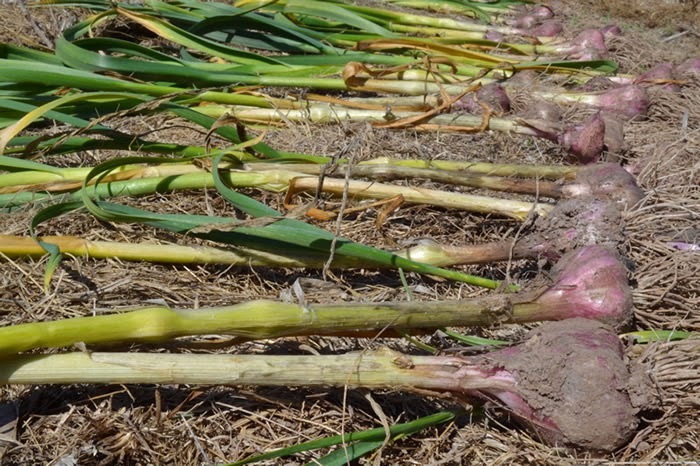 NSW Department of Primary Industries reports that the introduction of improved varieties of garlic and a greater appreciation by shoppers of the fresh product has improved the market prospects for locally grown garlic. Over the last 15 years AGIA’s membership base has shifted and now includes a larger proportion of boutique growers who sell their product at farmers’ markets and at the farm gate. ‘We understand the broader communities dislike for imported garlic—they keep telling us at our famers market stall, says AGIA chairman Leon Trembath who is passionate about educating consumers. Jocelyn Colleran is someone who is also passionate about educating consumers about garlic. She is a boutique garlic producer in the Upper Myall Valley near Gloucester. Jocelyn runs garlic-growing workshops and is passionate about cooking with garlic. She has organised themed dinners where garlic features as the main ingredient in all courses—including dessert. In 2012, chef Will Lute created a vanilla bean pannacotta with burnt orange garlic caramel sauce, garlic toffee and honeycomb crumble. Jocelyn says it was simply stunning. It’s also useful to know that the garlic season in Australia begins in September with garlic harvested in the warmer areas of Queensland. 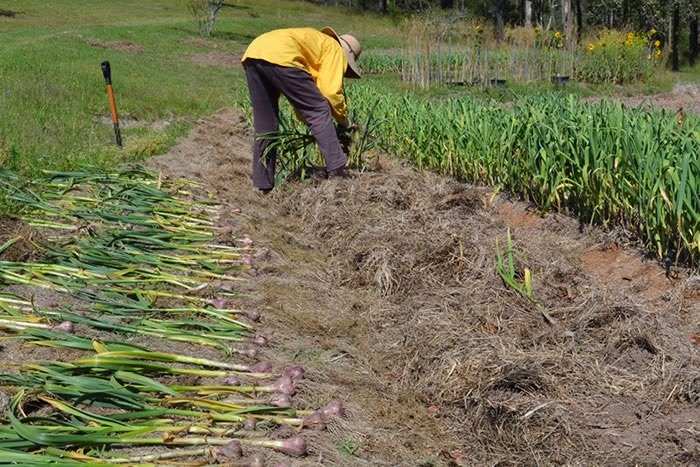 The harvest then travels south with NSW garlic harvested early to mid-November, Victoria and South Australia in early December and January and December in Tasmania with the Australian garlic season ending in February. Garlic stores well and will keep for months in a cool, dry, ventilated place. One of the aims of AGIA is to develop a web of growers to supply garlic to the market year-round. Understanding the different varieties of garlic is also paramount to ensuring that Australian garlic is available all year round. Jocelyn also wants to encourage people to use different parts of garlic at different times of the year. Spring garlic, for example, is garlic harvested before it has fully matured. You use it as you would a leek and store it in the fridge,’ she says. She shares more garlic cooking tips below. 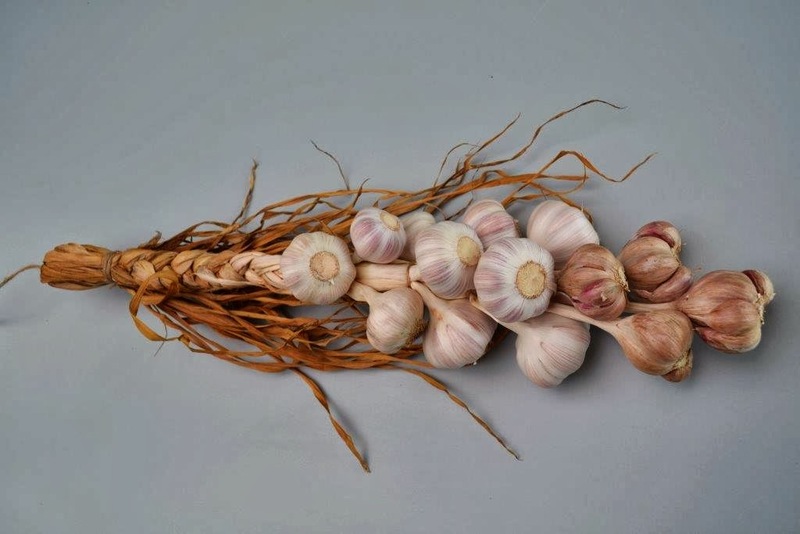 A fresh healthy and well-dried bulb of garlic should not have any smell and therefore garlic should not be selected for purchase on this basis says Jocelyn. Once a garlic clove is crushed or cut, the cell wall is pierced and a reaction takes place as the enzymes mix with volatile sulphur containing compounds. This results in a pungent garlic aroma. The flavour and aroma intensity can be altered by the way in which it is prepared advises Jocelyn. · Finely diced or crushed garlic is garlic at its most intense. Before using it in your cooking, Jocelyn suggests leaving it for a few moments to allow the full flavour profile to develop before it is added to food or subjected to a heat source. · Sliced garlic provides a less intense flavour profile. 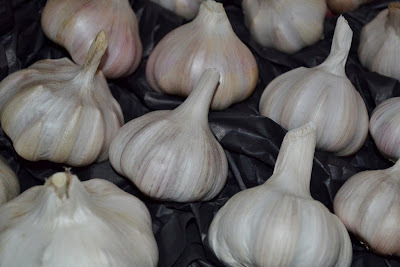 · Whole cloves in casseroles, soups or in roasts provides a more subtle, often sweeter garlic element to the dish. Garlic is relatively easy to grow, Jocelyn says, however you must have patience: the average crop takes 6 to 8 months to grow. Here are her 10 steps to growing your own garlic. 1. Select an open sunny, well-drained plot with well-balanced soil. 2. By March, obtain the best and most local garlic bulbs ready to split into single cloves for planting. 3. During April plant cloves pointy end up and cover with about 2cm of soil. 4. Immediately cover with about 25cm of loose mulch. 5. Watch with amazement as the new garlic shoots grow up through the mulch. 7. From mid-October onwards watch your garlic to see when about half the leaves have turned brown. 8. Gently (fresh garlic bruises) loosen soil under the bulb and remove, keeping leaves and roots intact and shake off excess soil. 9. Hang to dry immediately in a very airy dry place out of direct sunlight for 2–6 weeks until the outer wrappers are quite dry. 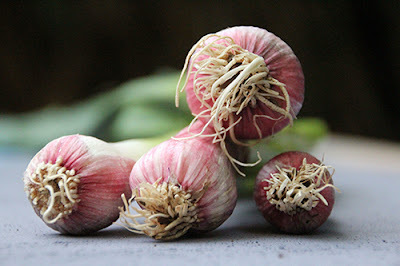 (Enjoy the stunning colour and taste of a few (they won’t keep more than a few weeks) of the freshly harvested garlic bulbs. Cook like leeks or spring onions and use the green stems as well. 10. Keep in the kitchen in bunches or braids or as trimmed single bulbs to use when needed. Make sure to store them out of direct sunlight and where there is good air circulation but never in the refrigerator. Black garlic is described as sweet meets savoury. It is garlic that has been allowed to ferment in a chemically free environment where humidity and temperature is strictly controlled. The garlic retains its form while the outer wrappers of the bulb turn a caramel colour and the cloves turn black. Black garlic is particularly sought for its medicinal properties. Jocelyn says that while some nutritional and medicinal properties are lost in the fermentation process, others are enhanced. 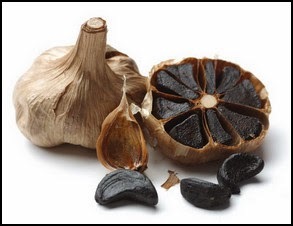 Calcium, protein, and anti-oxidant qualities are said to be significantly higher in black garlic. The third annual garlic dinner will be held at Roadies Café, Gloucester in mid-January 2014. For details call 6558 2772 or email Jocelyn at jcolleran@bigpond.com. 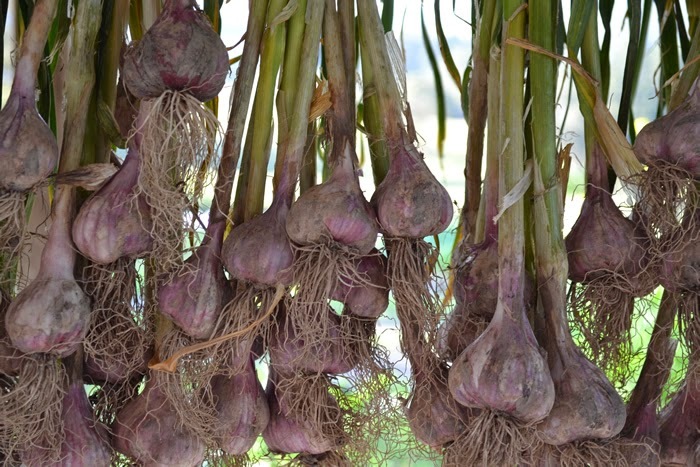 You can purchase quality Australian garlic direct from Australian growers. Some of these are listed below. Please note: Photos above differ slightly to those published in the original article. Very interesting! I've had black garlic once and it was quite an experience, but I haven't been able to find it in markets. Will keep looking. Nice put up here. I liked it. Thanks for share..